▲ Made of ABS & PPE material, environmental protection and without pollution, also lightweight can easy to be carried by Kids. 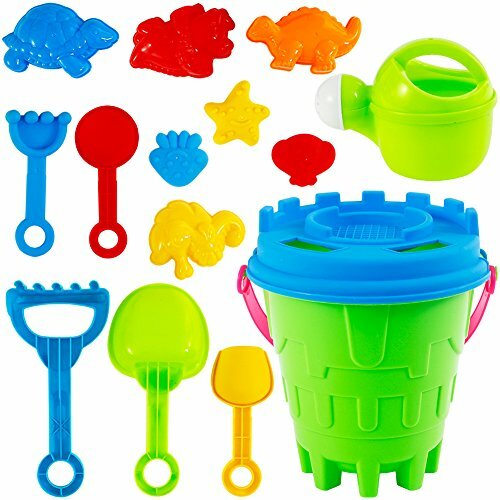 ▲ 15pcs includes everything your child requires to have jumbo fun imagining things into reality.The set includes 7 moulds, 5 shovels 1 bucket, 1 watering pot and 1 lid, all in one set, could be carried easily, could also bring lots of fun. ▲ Bright colors are perfect for summer beaches. This beach toy set will keep your kids busy and motivated for hours, providing them with hours of imaginative games, promoting hand-eye coordination and critical thinking skills. ▲ The mini size makes the suit light and portable,easily adapts to any environment. Whether you are at the beach, in the bath, the yard or at the park, the toys are perfectly suitable for playing with sand, water and other molding materials. ▲ Great choic as a gift for kids.No matter what the occasion, children will like colorful things, especially beach toys.Also idea for family summer holiday.Play with your children, build a castle together, and enjoy the joy of manual labor.